The ultimate camping guidebook for eating real food in the woods – designed for everyone in the camping spectrum, from rookies to the experienced. * If you’re a camping rookie and interested in tent camping, this book is for you. * If you are an experienced camper but new to real food living, or you just wish you had more ideas for whole foods camping fare, this book is for you. * If you camped before having children and have always wanted to try camping as a frugal family vacation but are nervous because you have little ones, whether they’re babies, toddlers, or preschoolers, this book is for you. Camping is a frugal family vacation and a wonderful tradition for many, but it’s not as easy as making a reservation at a hotel. 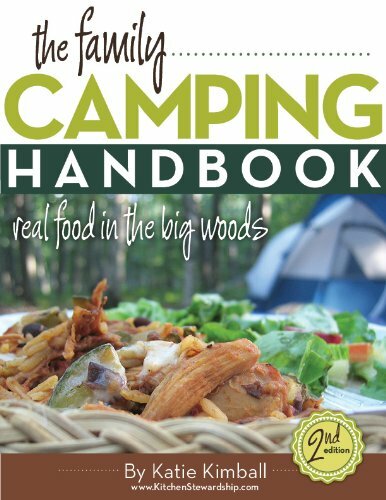 You CAN take your babes and your real food to the woods and truly enjoy it, and The Family Camping Handbook will show you how. * Families with little ones can survive and even THRIVE out in the woods. * Basic steps in preparing for and enjoying time in the back wood, plus tent camping strategies for rookies. * Recipes and campfire techniques to conquer the temptation of hot dogs and white bread buns. >> In the hands of over 30,000 happy campers! Join thousands of families across the nation who are camping in the woods with real food. You’re not just buying a book of packing lists, tips for campsite management or recipes…you’re buying confidence, and The Family Camping Handbook will have you feeling ready to hit the woods in no time. With over 35 whole foods camping recipes plus techniques for campfire cooking, menu plans, grocery shopping lists, and ideas to “healthify” many standard camping foods, you won’t go hungry out in that big, wide wilderness. With delicious recipes like these, you may never want to come home to your regular kitchen! * Homemade Beef Jerky and lots more! New! Each purchase now comes with 3 free printable gluten-free camping menu plans and new recipes from the author.